Yapper’s logo has a lot of energy in it. The yellow and blue coordinate well together. We took those colors and worked them throughout the site – yellow for the magnifying glass in the search bar, as the buttons for the category pages, to highlight unique selling points and teal for the “shop now” and “buy now” buttons. Overall, the store looks great! It’s important to make the header of any site stand out. For Yapper, we kept the header fun and playful. The store logo, a satisfaction guarantee, and a search bar kick off this custom ebay cell phone store design. We then created a menu so that customers can learn more about the store from which they are purchasing products. This is where customers can learn more about payment terms, return policies, and shipping information. Next, we created a mostly text header image. 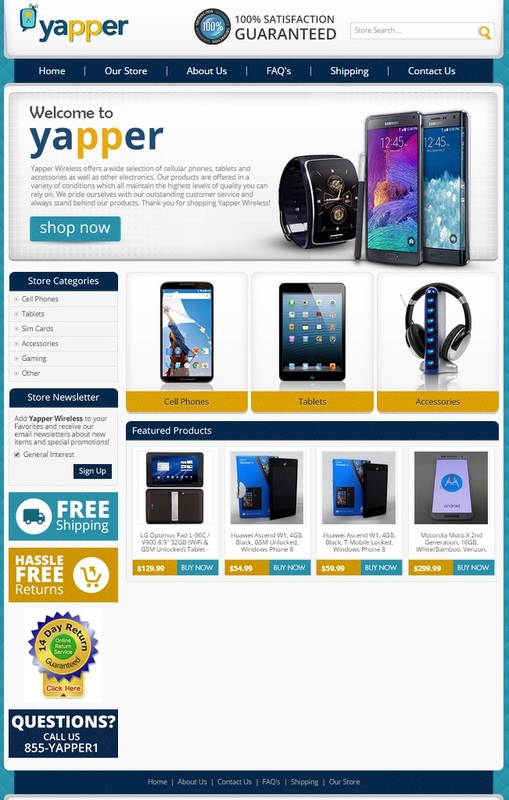 Sure, there are images of cell phones and a watch, but we also left a lot of negative space to help text about the types of products carried by Yapper stand out from the background. One of the most important things about an eBay store is that a store has made it easy for customers to find the items for which they search. We took time to ensure that customers could do just this. We created image buttons for the three main categories of products carried by our client, and then we listed the rest of the categories in the sidebar. Between these navigational tools and the store’s search bar, customers should be able to locate those items for which they search quickly. When stores regularly change out the products they feature, it helps to encourage customers to come back. Featured products areas give the clients we serve an opportunity to show customers what’s new, on sale, or of particular interest in their store. When these products are switched out at a regular interval, it helps to encourage both impulse purchasing habits and repeat business – boosting a store’s bottom line. When you’re browsing our website, you will notice that at OCDesignsonline, we have a wide array of eBay listing templates. Please take your time browsing our portfolio. When you’re ready, request a free quote. You can also find us on Facebook, Twitter, and Google+ for more ideas!